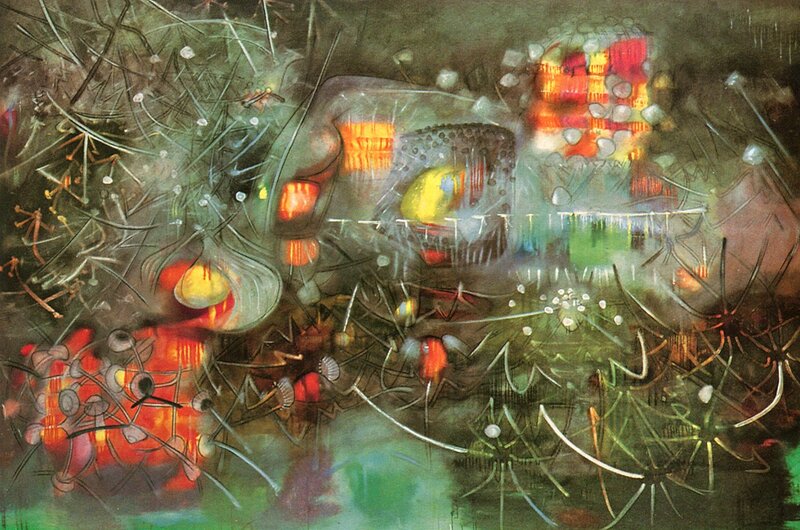 The painting “Bringing Light without Pain” above is by Roberto Matta, an artist with a Scorpio Mercury and Sun (11/11/1911), and so an apt painter to showcase in this time when Mercury is retrograde in Scorpio and headed toward it’s “inferior” conjunction with the Sun in Scorpio. While being able to bring light “without pain” during this period of Mercury retrograde in Scorpio is perhaps unlikely, the goal of connecting with more light, integrating more light into our lives by the end of a deep process of shedding burdensome past patterns or identities is a reachable potential over the next month. Roberto Matta first came to my attention when I saw astrologer Gonzalo Romero present a lecture on Mercury in 2011 in which he drew attention to the artistic perception, expression, and communication of Matta. Gonzalo described Roberto Matta as having a mercurial ability to “make the invisible, visible” through his artistic expression of aspects of phenomenal reality he could perceive. 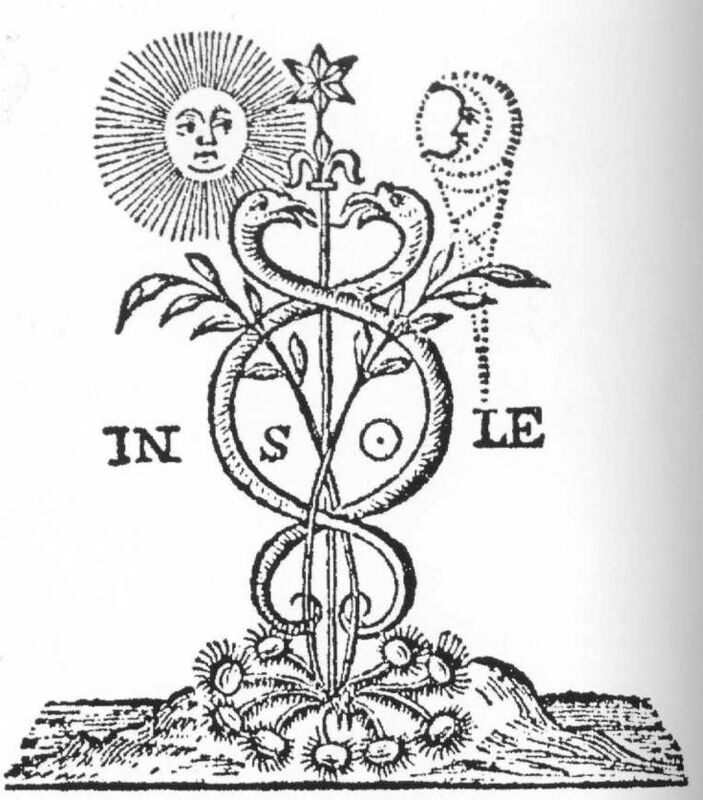 Among other things, Mercury is a function in astrology aligning with what part of reality we choose to perceive and order within our consciousness in order to structure such aspects of our life as how we communicate with others through speech, writing, sound, or art. As a result, when Mercury goes retrograde we have a unique opportunity to investigate what we have been choosing to focus on in our perceptions, and what sorts of habitual mindsets and thought cycles may have been dominating our mental space. With awareness then comes the potential to transform the way we are choosing to think about aspects of our reality that have been leading us toward greater negativity or suffering, in order to shift our mindset to help us create more of what we want to experience in our lives. Mercury retrograde time periods have gained a negative reputation in popular culture and sometimes make people wary or fearful of what could happen with mishaps in communication and technology, but in reality Mercury retrograde periods offer many gifts and opportunities to change and reset deep rooted patterns in our being. This upcoming Mercury retrograde periods promises to be one of the most potentially regenerative and transforming retrograde cycles in memory, as it involves three passes with Saturn in Scorpio and happens at the same time as an exact square between Uranus in Aries and Capricorn in Pluto. Moreover, there are eclipses occurring at the same time, with a Lunar Eclipse occurring shortly before Mercury stations retrograde, and a Solar Eclipse occurring shortly after the powerful moment of the retrograde cycle in which Mercury and the Sun become conjunct. Mercury aka Hermes is not only the God of Communication but also a God of Thresholds and Liminality, a Guide of Souls who is a Psychopomp able to move between the underworld and the upperworld. The term “liminality” is from the Latin root meaning “threshold” and is an appropriate description for the eclipse and Mercury retrograde period of time we are in since one of it’s meanings from Anthropology is “the quality of ambiguity or disorientation that occurs in the middle stage of rituals, when participants no longer hold their pre-ritual status but have not yet begun the transition to the status they will hold when the ritual is complete” (wikipedia). In Depth Psychology, liminality has also become a descriptive word used in the process of Individuation when an individual experiences feelings of disorientation and darkness as an old identity breaks down, all the while in a fluid process of becoming more whole or authentic, an “in-between” space of being that can persist for great lengths of time. Now, in the liminal space we are entering in between eclipses and during a time of intense astrological transits, we may feel confused, what we feel may turn out to be very different than it first appears in the moment, and where we are headed may be unclear, but it is good counsel at this time to realize that simply breathing, and allowing ourselves “to be” with whatever is happening in the moment will be a strategy useful to navigate our upcoming experiences. Of course, sometimes experiences suddenly demand that we quickly respond and initiate action, but no matter how intense experiences may become, if we can keep ourselves in the flow of things and persevere, eventually we will begin to realize why we are on the new path events led us to. The alignment of celestial bodies above us is too astounding for it to be any other way. Indeed, this Mercury retrograde cycle and other surrounding transits will be taking us to the heart of many of the astrological themes I have been writing about over the past year on this blog. At the heart of this Mercury retrograde cycle we will have the opportunity to open our hearts to a greater extent, as the fourth of the seven squares between Uranus in Aries and Pluto in Capricorn occurs on the same day as the inferior conjunction between Mercury retrograde and the Sun in Scorpio. As there are seven squares between Uranus and Pluto occurring between 2012 and 2015, the fourth one occurring on November 1, 2013 has been linked by many to issues around the 4th Chakra, or Heart Chakra. In order for us to reach a greater heart opening in our lives, Mercury retrograde in Scorpio will align with not only our ability to transform the way we are perceiving and communicating, but will give us the opportunity to go the depths of our core soul issues on all levels, meaning in a manner impossible for me to describe with the limitations of language. At the same time, there will be a real opportunity for us to take action to help us transform, as there will be a mutual reception occurring between Mars in Virgo and Mercury in Scorpio (this is because Mars is the traditional ruler of Scorpio, and Mercury is the traditional ruler of Virgo), with an exact sextile between Mars and Mercury on the same day that Mercury is conjunct the Sun in Scorpio and Uranus is exactly square to Pluto. Since these intense astrological transits on November 1 come with the dawn of the day following Halloween or Samhain, a night in which the veil between the worlds is traditionally viewed as being more open, we will be in a truly magical night to celebrate Halloween and Samhain in 2013, a liminal space to don our archetypal masks and costumes. Mercury in Scorpio conjunct first the North Node of the Moon, and then Saturn between 7 and 11 degrees of Scorpio. At this time Mercury was also at its greatest distance in elongation from the Sun in its cycle, being 28 degrees ahead of the Sun. 10/25/13: Heliacal set in the West at Sunset for Mercury in Scorpio- Mercury is at the phasis point of being 15 degrees away from the Sun, meaning that Mercury now descends to the Underworld in mythic terminology and will correspond with a more subjective, reflective, and intuitive perception. 11/09/13: Heliacal rise in the East at Sunrise for Mercury in Scorpio- Mercury is once again at the phasis point of 15 degrees behind the Sun, meaning that Mercury now ascends to the Upperworld from the Underworld in mythic terminology and will now correspond with a more objective perception as Mercury stations direct and moves forward as a Morning Star. 11/27/13: Mercury in Scorpio moves beyond its retrograde shadow zone of 19 degrees, while in a wide Grand Water Trine with Jupiter in Cancer, Saturn in Scorpio, and Chiron in Pisces. The most obvious aspect of the current retrograde cycle of Mercury in Scorpio is that it will be conjunct Saturn in Scorpio three times, and that it occurs in between eclipses. Just the fact that a Scorpio Mercury in retrograde would conjunct Saturn three times, station retrograde a few days following a Lunar Eclipse, and then have its inferior conjunction with the Sun occur a couple of days before a Solar Eclipse, is amazing timing. When we consider that the Lunar Eclipse initiating the Mercury retrograde is the first Aries/Libra cardinal eclipse that will become more prevalent in 2014, it gets more interesting, especially since the day of the Uranus-Pluto square and inferior conjunction between Mercury retrograde and the Sun occurs on a dark moon before a Solar Eclipse. However, when we take in all of the other myriad transits occurring during this time period, outlined above, it becomes even more extraordinary. If you have planets in your chart around the degrees of 8 to 10 or so, you will especially want to investigate how the upcoming transits will impact your chart. In addition to the prominence of Saturn in Scorpio in relation to Mercury, the next planet that becomes prominent upon a closer look is Neptune in Pisces. This is because when Mercury in Scorpio eventually stations direct on November 10, 2013 it will be in trine to Neptune, and then Neptune will also be stationing direct a few days later on November 14, 2013, meaning that Mercury and Neptune will both be stationing direct at the same time in trine to one another. The connection between this Scorpio Mercury retrograde cycle and Pisces Neptune is deep rooted, and will be important for those of us doing deep processing because the next Mercury retrograde cycle that will happen will be in Pisces and then Aquarius in February of 2014, aligned with Neptune in Pisces to such an extent that when Mercury stations retrograde it will be conjunct Neptune in Pisces. Thus, at this time and across the next five months, the universe is displaying clear signs of the significant relationship between Mercury retrograde and Neptune in Pisces. 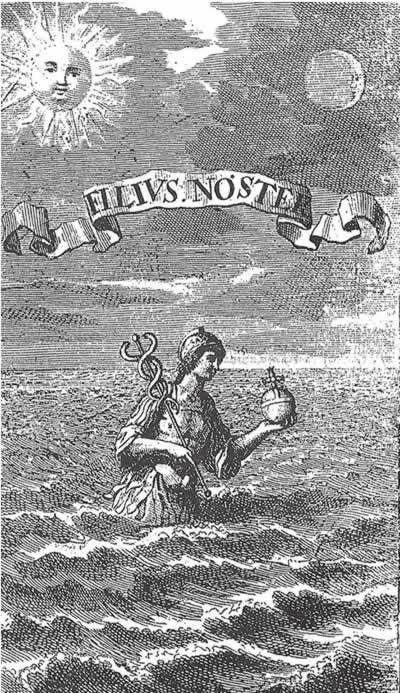 Neptune is a planet of illusion, and while one may argue that all of life is an illusion, it is through our perception of reality and what we choose to focus on through observation or belief that often pulls us into illusory thinking leading to behavior misaligned with how to navigate at an optimal level. Since the current Scorpio Mercury will conjunct both Saturn and the North Node of the Moon in Scorpio three times during this time period, our greatest growth will come through taking a brutally honest look at ourselves in the mirror and facing our fears and past wounds in a way that helps transform them like a Phoenix in the fire, so that we can more fully experience the now and be more fully alive in the present moment of our current reality. However, since we will be experiencing this potential at a time of Mercury being retrograde, we will gain awareness of a path toward transformation less through rational analysis and more through following omens, signs, intuition, and images from dream that arise before us. In contrast, if we act from a place of past fear or wounding, victimize ourselves or focus on blaming others, it takes us into a greater likelihood of the lower nature of Scorpio, the more manipulative side that will use illusion in order to try to manipulate, control, or shame others. Even if we are doing our own hard work of authentic and honest processing at this time, it will be important to remember that many people around us will not be doing deep internal work, and that many people may continue to act out or throw tantrums of one kind or another from a state of mind of believing that they understand reality in a way that is not actually connected to the deep, regenerative shifts in reality that will be in process at this time. Those fixated in belief of one kind or another, unwilling to examine the underpinnings of their beliefs or their judgments toward others, most likely will end up coming into conflict with others to a greater level of intensity than normal as the square between Uranus and Pluto comes into exactness on November 1, 2013. Traditionally, November 1 is known as the “Day of the Dead,” a time to honor family ancestors through artistic expression and symbolic perception that are perfect for a time of Mercury being retrograde in Scorpio. However, the Day of the Dead this year will be an especially auspicious time to also release past family karma that we may discover is a source of limitation for us, as November 1 will be a Dark Moon prior to a Solar Eclipse in which there will be a conjunction in Scorpio between the Sun and Mercury retrograde, in addition to the square between Uranus and Pluto. A great help will be the Grand Water Trine that has been occurring between Scorpio Saturn, Cancer Jupiter, and Pisces Chiron, the transitional celestial bodies of astrology that help bridge the more personal energy of Mercury, Venus, and Mars with the more galactic and “out there” energy of Uranus, Neptune, and Pluto. In fact, Jupiter will be stationing retrograde around the time of the Mercury retrograde cycle when Mercury becomes a Morning Star (this will be discussed in more detail below), and Pisces Chiron will be stationing direct at the end of November at the same time that Mercury will be picking up speed in its forward movement and leaving the retrograde “shadow” zone, meaning that Mercury will be moving past the point of its retrograde stationing at the same time that Chiron in Pisces stations direct. Among other themes, the stationing of Cancer Jupiter and Pisces Chiron during this time reveals that part of our Scorpio Mercury work will be about ancestral memories, family karma, family dynamics of our early childhood as well as all of the “family” dynamics of one sort or another we have created through relationship in our lifetime. The more we can sit with and sense the feelings that come up, without moving into a stagnant mindset of victimizaiton or negativity, the more we can work on releasing some habitual thought cycles that have been limiting our full potential and expression. Finally, it is also significant that this Scorpio Mercury retrograde cycle will feature sextiles between Mercury and both Mars and Venus, meaning that there will also be important opportunities to work on our personal issues and behaviors at this time. As already mentioned, Mars being in the sign of Virgo and so in mutual reception with Mercury during this retrograde phase is a perfect use of the Virgo Mars energy, an archetype that can utilize various healing techniques and tools to problem solve and fine tune personal issues and patterns. At the same time of the Lunar Eclipse and the stationing of Mercury retrograde, Mars in Virgo was in direct opposition to Neptune in Pisces, adding even further drive and potential to our ability to deeply examine what sorts of illusions or misguided beliefs or judgments may be operating in our personal sphere of interaction with the world around us. The exact sextile between Virgo Mars and Scorpio Mercury will come at the same time of the inferior conjunction between Mercury and the Sun on November 1, the same day as the square between Uranus and Pluto- this is an extraordinary moment to align our actions and desires with the shift of feeling and perception we could be experiencing, in order to lead us onto a more fruitful path going forward. However, on a cautionary note again with the aspects between all of this and Neptune in Pisces, with Scorpio Mercury moving retrograde, we also must remember that what we could be sensing at this time may be existing in the more ethereal or astral realms than in the physical and concrete reality around us. It is a perfect time, however, to plant the seeds of bright dreams and great visions for our future. In comparison, Venus will shift into Capricorn and come into an exact sextile with Mercury around the time that Mercury stations direct in trine to Neptune in Pisces. Within a week, Venus in Capricorn will then become conjunct Pluto and in square to Uranus in Aries. Again, if we have been processing and releasing we could come into an opportunity to gain a greater capacity to begin manifesting greater abundance for ourselves and others in our life at this time. However, if we are still clinging to past beliefs and conceptions about our life and reality at this time, we could just as well face a great personal crisis or come into conflict with others. Since there are so many intense transits occurring during this time, there is no doubt that all of us will be stepping into challenging circumstances that test our mettle, and for those working on developing a more authentic identity for themselves, this newfound sense of identity will also surely be tested. However, Venus coming into contact with Pluto in Capricorn will also be in sextile to Saturn in Scorpio and the North Node of the Moon, and so the difficulties could also be part of a great transformation we will eventually be grateful occurred in our life. Despite a wealth of mythic support for the role of Mercury as being a Guide of Souls, the majority of astrological writing focuses on Mercury as being about communication issues rather than the relationship between our conscious and unconscious perceptions and the core issues of our psyche that connect with our ability to rebirth a more fully actualized Self. Demetra George has two lectures I recently listened to entitled “Hermes: Guide of Souls” and “Hermes: Guardian of Thresholds” that are available for a total of fifteen dollars on her website, lectures that are well worth the money for anyone interested in gaining a deeper mythic understanding for the Mercury cycle in astrology. 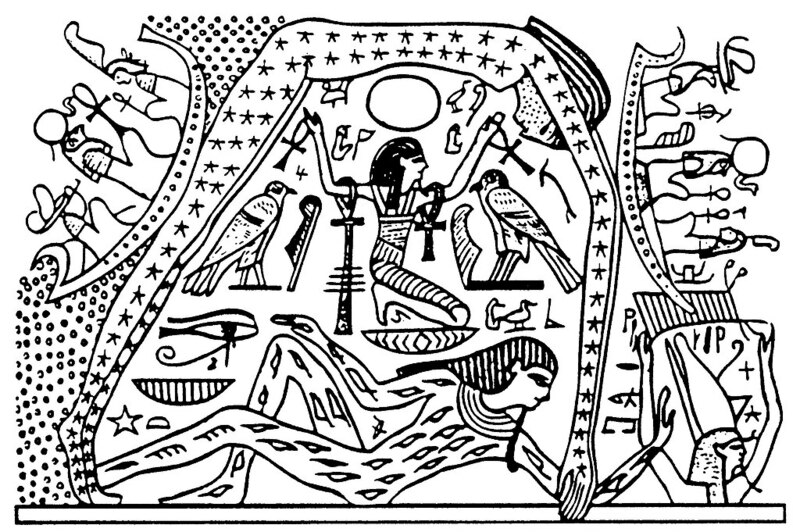 In these two lectures Demetra illustrated how Mercury is a figure who can mediate between the upperworld and the underworld in myth in a similar manner to how in the retrograde cycle we are currently experiencing, Mercury also guides us to a descent into the underworld in order to ascend again back to the upperworld with the potential for a reborn Mercury to utilize in our daily life. Mercury never goes more than 28 degrees away from the Sun, and fascinatingly enough at the beginning of October 2013 Mercury reached its greatest degree of elongation from the Sun at the same time it became conjunct the North Node of the Moon and Saturn in Scorpio. This first pass of Mercury across Saturn and the North Node at the time it began to shift into its slower phase that leads to stationing retrograde, set the theme for this cycle as being about taking total responsibility for our responses to and beliefs about life with the type of intensity demanded by a triple conjunction in Scorpio between Mercury, Saturn, and the North Node of the Moon. During the time from this first conjunction between Mercury, Saturn, and the North Node until now, Mercury has been an evening star and so operating on more of a subjective, instinctual, intuitive, and reflective level of perception. On October 21 Mercury stationed retrograde as an evening star, deepening and intensifying the intuitive sense of Mercury. However, an even more important date to focus on is October 25, when Mercury retrograde reaches its phasis point of being 15 degrees ahead of the Sun- this is the Heliacal set in the West of Mercury at Sunset, when Mercury will shift from a visible evening star to becoming invisible, the day in which Mercury descends into the underworld. From this first day of Mercury’s descent into the underworld up until November 1 when Mercury reaches its inferior conjunction with the Sun, we will be experiencing the most mystical and mysterious Mercury manifestations, a time in which we will more readily receive messages from our unconscious, intuition, dreams, omens, and signs. As Demetra George has taught, Mercury at this time will be a guide to our subjective and inner realms, and will be able to perceive through symbols more so than the articulation of words. This period of the Mercury retrograde cycle is similar to the Dark Moon phase, a time in which we gain a greater capacity to release old thought forms and concepts in order to prepare for an integration of the new visions on the horizon ahead of us. The ability for deep transformation will be facilitated at this time by Mercury retrograde in Scorpio becoming conjunct with Saturn on October 29, a few days after entering the underworld. This will be a powerful day for intention and to become aware on an intuitive level of what needs to shift and what we can allow to be- we will want to open ourselves at the same time to the possibility that some of the things we are called to shift at this time could be some of the very same things we have drawn great strength and pride from in our past. Next, on November 1 we will experience the square between Uranus and Pluto at the same time of the inferior conjunction between Mercury retrograde and the Sun in Scorpio. The inferior conjunction between Mercury and the Sun is like the potent moment of conception of the Mercury retrograde cycle. Whatever circumstance we find ourselves in on this day, an experience which could be intense as we ride the wave of the Uranus-Pluto square, remember to take the time to do something symbolic, even if only for a moment, to honor the rebirth of Mercury and the potential the moment will offer for us to plant the seeds of a new vision aligned with our passion and purpose. Remember, as this pivotal moment occurs a couple of days before a Solar Eclipse, we may be in a very disoriented and confused state of mind, so any practices we can take into this time period to help us relax, ground, and be present will be helpful. Finally, following the Solar Eclipse of November 3, a conjunction between Mercury retrograde in Scorpio and the North Node of the Moon, and then Jupiter in Cancer stationing retrograde on November 7, Mercury will enter its next significant phase of being reborn as a Morning Star and becoming visible again at Sunrise in the East on November 9 when it reaches the phasis point of being 15 degrees behind the Sun. At this time Mercury will ascend to the upperworld again and become more curious to gather new information with a slight shift to a more objective, logical, and conscious perception as Mercury will station direct on the next day. In the weeks following November 10, Mercury will begin picking up speed as it moves direct enthusiastically as the fleet footed messenger again, finally moving out of it’s retrograde zone on November 27, 2013. The phase of Mercury retrograde we will enter on October 25 when the Heliacal set at Sunset occurs not only corresponds to Mercury descending into the underworld, it also corresponds to Mercury functioning as the archetypal Magician. 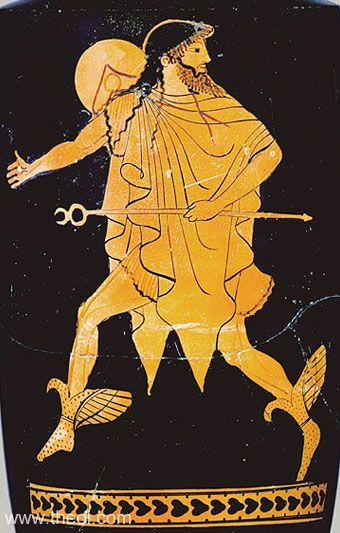 Hermes in ancient Greek myth performed magical acts at various times, and then in Hellenistic Egypt the ulitmate magician, Hermes Trismegistus was created through an alchemical combination of the mythic figures of Hermes and Thoth. In tarot, however, Mercury has always been connected to The Magician and linked to an ability to use all of the elements, all resources and techniques at one’e disposal, to completely transform one’s life through a clear and strong intention, vivid invocation of a new vision, and the channeling of universal energy. In the image of the Magus above painted by Joyce Eakins from the Tarot of the Spirit deck, one can see the elemental tools of the pentacle, wand, sword, and cup: the use of elemental tools to transform our lives not only corresponds to the Scorpio Mercury retrograde phase we are entering now, but also to the mutual reception with Mars in Virgo that will be ripening to an exact sextile on the day of the inferior conjunction between Mercury and the Sun, the day of conception for our reborn Mercury. Mars in Virgo is a tool user, so it will be wise at this time to center within ourselves through each of our own unique creative gifts, tools, and techniques. 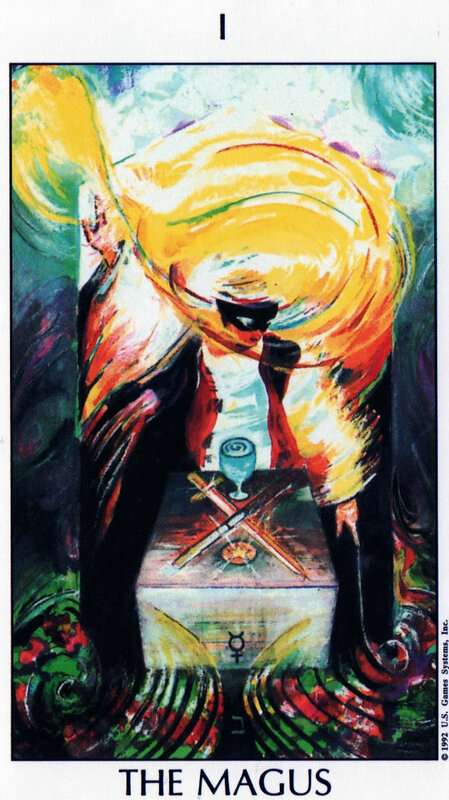 Like many other tarot decks, the Tarot of the Spirit deck from which The Magus image above is from connects tarot with not only Astrology, but also the Qabalistic Tree of Life. Mercury as The Magician card reveals the primal role Mercury plays in our process of manifesting form in our life through the Tree of Life, as The Magus connects the first path of Kether or “The Gate of Potential,” with the third path of Binah, or “The Gate of Form.” Kether corresponds with the aces of the deck and the concept of Source, the Source of all existence, whereas Binah corresponds with the divine feminine and mother, the realm of receptivity. The only other major arcana directly connected to Kether are The Fool and The High Priestess, so in this way Mercury as The Magician is able to help us transform our lives through wielding the elemental tools because it is the direct conduit between Source and Form in our reality. During this Mercury retrograde time in Scorpio, a time period that may correspond with great calamity around us, may we each take the moment to ground and realize our potential to transform not only our thinking, perception, and communication, but also the very fabric of our lives. Eakins, Pamela. (1992). Tarot of the Spirit. Weiser. George, Demetra. (2008). Lecture on Hermes: Guide of Souls. George, Demetra. (2012). Lecture on Hermes: Guardian of Thresholds. UAC. Thank you Judie, it’s always a delight to hear from you. I found a youtube on Roberto Matta’s art that is nearly 10 minutes long. Thanks for sharing your deep information on these powerful times and introducing me to Matta’s art. Thank you, Teresa. I’ll have to look on youtube for that video when I get the chance. His art is fascinating. Are you going to post on Venus retograde and solstice?